What’s it like to have a reality show fix your house? Since the launch of Home & Garden Television—more commonly known as HGTV—in 1994, the network has instructed countless weekend warriors and do-it-yourselfers in the ways of home renovation, landscaping, and decor. But it took a trend started by HGTV’s corporate cousin, The Food Network, to truly raise the channel’s profile. Following the 2006 debut of HGTV Star—a variation on Food Network Star, the reality competition that shoulders the blame for foisting Guy Fieri on the world—HGTV’s programming has become increasingly personality-driven, with a schedule dominated by the likes of House Hunters, Property Brothers, and Love It Or List It. On these shows, the focus falls largely on the outsized characters overseeing the jobs, rather than the work they’re doing. So what’s it like to hand your house over to the stars of HGTV? In 2010, Cenate and Wendy Pruitt learned firsthand, when they and their Atlanta-area home were featured on Curb Appeal: The Block. 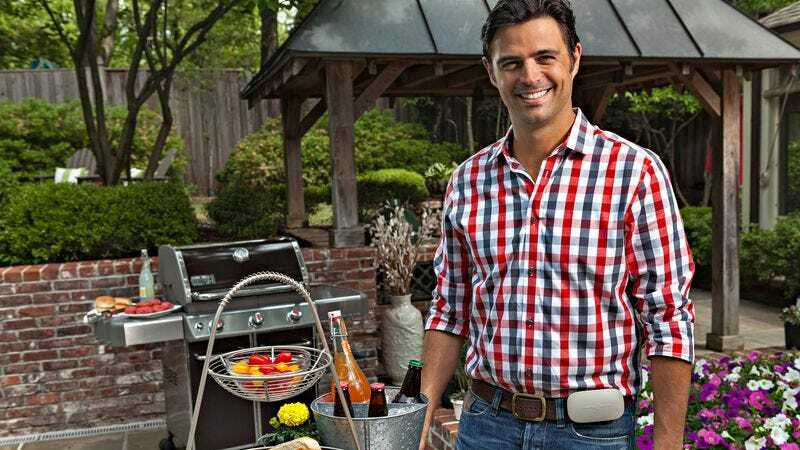 The house was given a $20,000 exterior makeover—but, as the Pruitts discovered, the specifics of that makeover were decided well before host John Gidding and his crew arrived. (Those specifics also included aesthetic improvements, like a basement retaining wall into which a downspout drains, that ultimately did the property more harm than good.) The A.V. Club spoke with Cenate, a senior lecturer of sociology at Oglethorpe University, about the pratfall that landed the gig for the Pruitts, what it was like to shoot a renovation out of sequence, and the strange experience of being a guest star in his own life. The A.V. Club: At the time Curb Appeal came to your neighborhood, how many of the houses on the street had undergone renovation? AVC: In what other ways does the show’s presentation of the neighborhood differ from real life? CP: A lot of the establishing shots of the Atlanta area that they used were nowhere near the house. All the storefronts where people are walking their dogs—that’s several miles west of us. They’re just creating this little narrative of this nice little street. And it is a nice little street, there’s no crime or anything. What is definitely not as it was presented on television was the people. A lot of people that they interviewed were folks passing by. People who are cutting through on their way to work see lighting rigs and construction crews and people waving cameras and are like, “What is this? Oh, it’s HGTV and they’re interviewing people about the neighborhood?” So we knew maybe half the people that are identified as “neighbors”—some of them were friends of ours who posed as neighbors when they came to visit. I gather a lot of reality TV is like this: They play fast and loose with what a neighborhood is really like and who really lives there to construct that story. AVC: And a lot of that story is sketched out before production begins? CP: Oh, yeah. They did the build in late April, but we had our first meeting with the designers in maybe March, because it was all shot out of sequence. They came to our house to do some early, preliminary photographs and sketches and whatnot. And since my wife was unemployed, we happened to be home. So our dog is freaking out and when we went outside it was like, “Oh, the HGTV people are here.” My wife was leaving to go on a job interview and I was walking out with her because she was seven months pregnant at the time. They show up and we introduce ourselves and they have the camera crew there—and they stop us and say, “Actually, can you guys re-exit the house again and act like you all know each other? Because this is going in a different point of the show.” So when we met to go over the design, sketches, and color palette, we had to act like we’d never met each other even though we’d just met a couple of weeks earlier. In every way there’s some story being constructed—the story they want to tell. When I signed on, I thought part of it was like Extreme Home Makeover: You have this young couple and the wife just lost her job—and, by the way, she’s pregnant. I was like, “They’re going to play that up.” I don’t think any of that was mentioned in the final product. I think they did one throwaway line about how we were going to be parents, even though it came up repeatedly when we were being interviewed. They would ask, “What do you want the front yard to look like?” and I would say, “I want a place where I can play with my kid. I want a nice big yard with a patio where we can cook and entertain people and his friends can come over.” And none of that made the final cut. I don’t want this to be a “I hate HGTV—they’re jerks” thing. The one thing that, to this day, really changes things is that I questioned all the things that ended up having a negative effect on the house. “Are you going to move this downspout? What are you going to do about this drain?” In the finished episode, they cut together this montage of me asking, “Well what about this? What about this?” Then there’s a talking head of, “Sometimes the clients don’t know what they want. But it’s okay because we know what we’re talking about.” That’s the one thing that’s like, “Come on!” The montage of me asking about all this stuff they ended up ruining—it ends up with me looking like a moron when, in fact, it’s me being a conscientious homeowner. I guess that’s just how it goes. I have to be the dumb homeowner. AVC: Did you have a sense that the episode was skewing this way during production? CP: Not initially, because they shot hours of interview footage with us. They were very clear about “Don’t shave, don’t get a haircut” and that sort of thing. They asked all these questions like, “How do you think the building is coming? Are you excited? Are you worried?” There’s got to be hours of it on some DV tape somewhere. And that ended with the five minutes of us that’s in the episode. The rest is about the talent. And that’s part of that story. It’s not about us, it’s about the talent: “Look how great the talent is and look how awesome a job they’re doing. And oh, by the way, these are the people that own the house.” We were the guest stars in our own life. AVC: Prior to production, how familiar were you with HGTV programming? CP: I knew about HGTV, but shows like Curb Appeal were my least favorite. I enjoyed the shows where they showed you how to do things. “Here’s how we hang drywall, here’s how to select paint, here’s how to build a bird feeder.” Shows that were process-oriented, not talent-oriented. I saw through the local newspaper that HGTV was looking for people who wanted to get their homes renovated by a new show and I was like, “That sounds entertaining!” After I found out what the show was, I made an effort to catch a couple of episodes to see what it was about. It’s a pleasant enough show. The people are sad about their house, the designers come in and do this pretty thing, people are happy about their house, roll credits. It’s fine. Not my cup of tea as far as television goes, but it’s comfort food. It’s like Scooby-Doo:You always know what’s going to happen. It’s a different creepy theme park every week, but the Scooby gang figures it out and rides into the sunset. I think, on Curb Appeal, they literally rode off into the sunset. AVC: How far in advance did the casting process take place? The day they came to shoot all this exterior stuff and to interview me, it started snowing in the front yard. And it never snows in Atlanta. They asked us to dress “spring-y”—“Wear something short-sleeved, because we’re going to be filming this in spring.” So I’m out there in a polo shirt and jeans and it starts fricking snowing. So every time the cameras weren’t on us, we were running to get jackets and huddling with each other. AVC: You essentially hosted a television production and a construction project in your home for a couple of weeks. How was your relationship with the crew? The actual work was done by subcontracting construction crews. [The show] hires local renovation companies to come out and do the actual grunt work. Local companies, that, as I understand it, get paid peanuts to do it. But they get their names in the credits and on their websites so they can say, “As seen on HGTV.” So they get some modicum of publicity—and HGTV got their work. Somewhere in the house we have this itemized invoice of everything we were billed for and it’s right at 20 grand and change. AVC: So the subject of money just came up: Can you say how much were you paid to be on the show? CP: I don’t think there’s any contractual obligation that says I can’t talk about this—I hope there’s not or else we’re all getting sued. [Laughs.] We weren’t paid per se. The way it works is that we were hired by the production company for the use of our premises for the two weeks of the shoot. Our compensation was the work. And so at the end of the production, we were given a 1099. We were given a contract that said, “You were contractors on this production for two weeks. Your compensation is 20 grand and some change. As a contractor, you owe Uncle Sam and the state of Georgia ‘Y’ amount of money.” So there was no cash exchanged. The work done on our house was considered our payment. AVC: It’s been a little more than three years since you were on Curb Appeal. Have you been able to maintain the renovations? CP: I haven’t! The biggest shock was all the landscaping work. They put in all these beautiful mulch flowerbeds, then a Georgia summer killed all of it. Just about all the flowers they planted were dead in two or three months. They planted this fancy golf course sod in the front and it was immediately overtaken by crab grass. It got to the point where we had to hire professional lawn services to come out and maintain it. Once my wife went back to work, I was home all day—since I’m a professor and I keep college hours—with an infant, and the time for me to work in the yard was pretty scarce. So all those flowerbeds ended up getting overgrown—and because of the drain, every time it would rain, the mulch would wash down into the road. I would guess we ended up spending $1,200 to $1,500 a year hiring people to come in and clean it up. The real problem is the basement entry, where they built a retaining wall around the door—which is great for keeping water out of the basement. But on the other side of the retaining wall, it’s keeping water inside of the basement. So that’s been, to put it charitably, a nightmare. The first two or three times we had a hard rain, a couple of inches of water backed up in the basement. One night, I had to go out at maybe 9:30 or 10 to Home Depot—as it’s closing—and rent a swimming pool pump. I had to wade down into the basement with a swimming pool pump and pray to God I wasn’t going to electrocute myself. So that thing has been a pain. The way it’s built, I couldn’t keep my lawnmower or any other equipment in the basement because there’s a 90-degree turn and then a wall—so getting a lawnmower or anything like that out of the basement takes a Herculean effort. I had to buy one of those snap-together tool sheds—so now there’s a tool shed in the backyard to make up for the loss of space in the basement. Here’s where I have to give [the show] credit: The contractors who did the build came out multiple times to try and remedy the basement. They punched holes in the retaining wall for draining, they put French drains inside the retaining wall for draining. This is the craziest part: They re-routed the gutter downspout across the top of the patio. They did all kinds of things to try and mitigate it, but if it rains hard enough, it still backs up a little bit. Here’s the punchline at the end of the article: Tonight we have renters moving in. Two weeks ago we moved out and tonight I’m handing over the keys to a lovely young couple who are going to rent it for a while. AVC: Have you prepared them for the problems? CP: They know about it. I told them I’m going to have someone come in and do stuff in the basement and I’m going to get it fixed. In the meantime: Don’t put anything you particularly treasure down there. I don’t want to come across as bitter or resentful or anything like that, because while we were doing [the show] I had a grand old time. I got sunburned from hanging out in the yard just talking to the contractors and talking to the crew and doing things. I get messages on Facebook saying, “I saw you on HGTV!” People I haven’t seen since college. They said they were channel surfing and heard my voice on TV and were like, “Oh my God, Cenate Pruitt’s on HGTV!” My parents get phone calls at all hours from their friends saying, “We saw your son on TV! We saw you on TV!” So it was fun while it lasted. Then, like a lot of things that are fun, once the fun is over and you have to deal with the consequences—maybe it wasn’t so fun after all. Nothing but love for the production crew and the contractors for busting their humps. I’m immensely appreciative of those people and their hard work. I just wish things had been a little better planned. AVC: Do you feel the experience contributed toward your pop-culture scholarship?